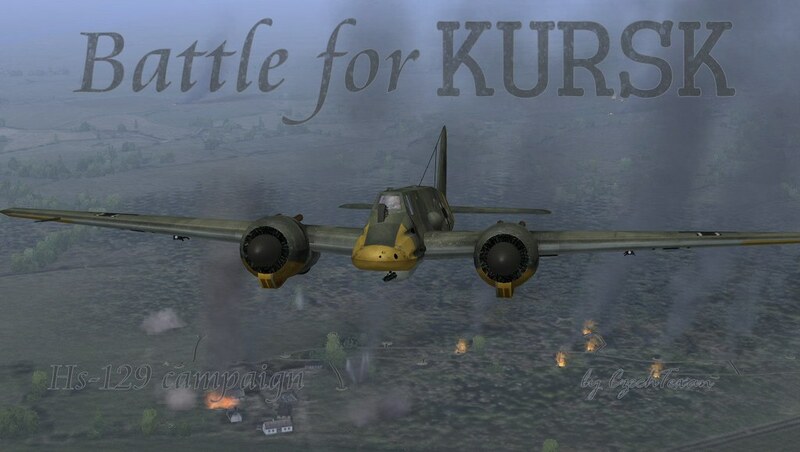 A 15-mission campaign based on historical events in which you will fly a Henschel Hs-129 in the battles for Oboyan and Prokhorovka in the Battle of Kursk, July 5-15, 1943. This campaign should work fine on any mod pack install that has Cyberolas' Prokhorovka map and is capable of using taxi-takeoff and takeoff in pairs/line. If using the stock Prokhorovka map there may be issues! This 15-mission campaign represents my take on the Battle of Kursk on its southern flank during the ten day time period of 5-15 July 1943. There were many other large battles leading up to the famous "Prokhorovka Tank Battle" which has overshadowed everything else. In this campaign I hoped to shed some light on the other forgotten battles which can be followed on a day-by-day basis. The front lines are historical to make it easier to follow the flow of the battle. Historically, the weather during the Battle of Kursk was sometimes rainy and very cloudy. I tried to represent this as best as possible. I also used low clouds to simulate the very smoky battlefields with low visibility. Hopefully, users will have very good computers because some of the battles are huge and use much memory. I noticed that smoke really lowers my frame rates. I tried to limit the number of aircraft to help with the problem. I made four new skins for the IL-2M-Late and one new skin for the La-5FN using vpmedia's templates. Most other planes use default skins because vpmedia's default skins are so great. I chose to use the Default Skin for the Hs-129 because of the quality is so good and it is made by vpmedia. This looks great. Having a blast (!) flying your IL 2M version. Excellent work, and thank you for all your campaigns. Any campaign that is a duck campaign is a good campaign. Po-2 best fighter in universe. If it looks like a duck and flies luck a duck and bites hard with Mk103 - this is Hs 129 duck. I started this campaign in BAT. It looks fabulous, thank you very much. Many thanks! I like the 129 and the Stuka, as they are slow but mighty! The armored and mechanized troops of the Voronezh Front included the 1st Panzer Army (6th and 31st Tank and 3rd Mechanized Corps), 2nd Guards Corps. and the 5th Guards. tank corps, six separate tank brigades and eight separate tank regiments of direct infantry support, as well as a separate training tank regiment. In combat formations and units there were in service on July 4, 1943 more than 1,700 tanks, incl. 42 heavy KVs, 1086 medium T-34s, 380 light T-60s, T-70s and T-30s, as well as 42 heavy Mk-IV "Churchill", 18 medium Mk-II "Matilda" 82 medium-sized M3s "Lee" and 51 light M3l "Stewart". The assault grouping of the Army Group "South" in the 3rd, 11th, 6th, 7th and 19th Panzer Divisions, the Grenadier Division "Great Germany", the SS Grenadier Divisions of the SS "Leibstandart", " Dead Head "and" Reich ", 39th Tank Regiment (included in the division of" Great Germany ") and 503rd heavy tank battalion had 1,269 tanks, of which 102 heavy Pz.VI" Tiger ", 200 medium Pz.V "Panther", 377 medium Pz.IV, 416 medium Pz.III, 51 light Pz.II and about 70 special and commander without artillery armament, as well as 25 captured T-34 tanks. In terms of the number of assault guns and self-propelled guns, Army Group "South" was much superior in this form of armament to the connections of the Voronezh Front. Only StuG.III assault guns were in three separate divisions of assault guns and in divisions of assault guns of tank-grenadier divisions more than 250. By mid-1943 self-propelled artillery of the Red Army was small, on the Voronezh front on July 4, 1943, consisting of three separate self-propelled artillery regiments there were only 53 units SPAG: 17 light SU-76M, 24 medium SU-122 and 12 heavy SU-152. Considering the Prokhorov battle in the general context of the Kursk defensive operation of the Voronezh Front, one should not lose sight of the fact that even with respect to the quantitative composition of troops and armored vehicles, as well as operational results, it can not obscure other combat events of the Battle of Kursk, primarily in the massing of armored vehicles. In the first hours of Operation Citadel, three divisions of the 48th Panzer Corps concentrated around 600 tanks and assault guns on the 8-km main strike zone. The unprecedented number of combat vehicles of the division "Great Germany", up to 360 units, operated at that only in the Cherkasy region - Korovino. Overcoming the stubborn resistance of infantry and artillery units of the 6th Guards. army, breaking through the main line of defense, the Germans on the second day of the offensive came to the second defensive line. Here, in the sector of the front with a length of 20 - 24 km, the 1st Panzer Army was deployed - the 6th Panzer and 3rd Mechanized Corps in the first echelon and the 31st Panzer Corps in the second. Approximately 550 tanks and assault guns of the 48th Panzer Corps, which suffered some losses on the first day of the operation, but did not noticeably reduce its combat potential, opposed up to 430 combat-capable tanks from the composition of only two corps of the first echelon of the 1st Panzer Army. In total, in combat in this front zone, without entering the second echelon battle, which occurred later, approximately 980 units took part on both sides. armored vehicles. For comparison, we point out that during the battle on the Prokhorovsky direction on July 12 as part of the 18th, 29th, 2 nd and 2 nd gv. tank corps 5 gv. tank army, operating in the 18-20 km stretch, there were about 520 tanks and automatic control systems. The opposing three tank-grenadier divisions of the 2nd Panzer Corps at this time had up to 300 tanks and assault guns in service. Thus, on both sides the opponents involved about 820 units. armored vehicles. A few days earlier, on July 8, a counter-attack was conducted on the Prokhorovsky direction by forces of the 2nd Guards, the 2nd and 5th Guards. tank corps on the battle formations of the tank-grenadier division SS "Reich". The structure of these buildings consisted of approximately 350 tanks. In the SS division there were more than 100 tanks and assault guns. On July 12, at the Prokhorovsky Field, the 29th and 18th Panzer Corps attacked the SS Leibstandarte Division, which had a nearly one-third less number of tanks and assault guns than the Reich division, with approximately the same number of combat vehicles. Even if we consider that several dozens of SS Reich and Dead Head combat vehicles were able to operate on the flanks of the Leibstandarte division periodically in the offensive zone of the two Soviet tank corps, the total number of armored vehicles on both sides was not much higher than 450 units, noted by us in the counterblow on July 8. Soviet tankmen lost about 100 tanks on July 8, much less than on Prokhorovka field on July 12, and the enemy is about the same number as in the battle near Prokhorovka. It should not, however, exaggerate the capabilities of both German and Soviet aircraft in part of the strikes against tanks and troops that have occupied field fortifications or tanks dispersed on the battlefield during the attack. If the troops that were outside the shelters or did not manage to hide were carrying losses, then there are no data on more or less significant losses of armored vehicles from air strikes on the Prokhorovka field. It is known, for example, that the 1st Panzer Army of Katukov for all the fortnight of the defensive operation, having experienced repeated air strikes, lost as a result only 2% of the tanks from their total losses. Tanks and self-propelled guns, as well as troops that occupied defensive lines, hit artillery shells, and as for enemy armored vehicles, a great role was also played by mine weapons. Aviation in this case, of course, fettered the actions of armored forces and infantry, had a strong psychological impact. The results of the battles on the Prokhorovka line on July 12 turned out to be discouraging for Moscow, and the impression on Stalin was not made by losses, but by the fact that the huge forces put forth from the Stavka reserve went to waste. With a huge loss in tanks, which served as an indicator of the situation, the tasks were not fulfilled. In one day, Soviet troops spent a large part of the so-prepared and fully manned reserves, an extremely important instrument of influencing the strategic situation. On the personal instructions of the Supreme, a special commission was set up under the chairmanship of G.Malenkov. The commission understood the reasons for such huge losses incurred in one day, and called the battle at Prokhorovka "a model of an unsuccessfully conducted operation." Approximate total losses of the Voronezh and Steppe fronts in the Kursk defensive operation from 5 to 23 July, according to official figures, were 143950 people, including 54994 people irretrievable (in this number were captured soldiers). Losses of Army Group "South" - 34554 people, incl. killed 5,699 people. There were 1203 people missing, 27,334 people were wounded. The ratio for the total losses of the sides is 1: 4,2, for irrevocable losses - 1: 8. The armies of the Voronezh and Steppe fronts advanced 21 days to a depth of 140 km with the width of the front of combat operations at 300-400 km, fulfilled their assigned tasks, liberating Belgorod and Kharkov. Tank fighting in the area of Bogodukhov and Akhtyrka, not so well known in military history, in terms of the scale and quantity of armored vehicles introduced by both sides, was not inferior to the operations of tank troops near Oboyan and Prokhorovka. Thus it turned out that without achieving significant and absolute operational-tactical success during the Kursk defensive operation, it was possible to ensure a major and undisputed strategic result in this direction during the summer company of 1943 as a whole. The calculations of the German military and political leadership turned out to be vicious, because they did not take into account the potential of the country that they hoped to win. Despite all the setbacks and heavy losses, in the long term this factor had a decisive influence on the outcome of the confrontation. And the Battle of Kursk, and one of the most intense stages of the battle - the Prokhorov battle, considered from different angles of view, from individual clashes to the operational-strategic level, clearly demonstrate this regularity.